Both the front door and the front door canopy are your house’s calling card and the first thing you and your visitors notice upon entering. Therefore, door canopies should live up to the owner’s values and demands regarding exclusive style, premium design and high-quality manufacturing in traditional craftsmanship. A visitor can feel welcome upon entering the house when greeted by the special ambience of the luxurious and sophisticated door canopies. The house residents will also value the superior design highlight set by the front door canopies when entering or leaving the house. Unopiù’s door shelters give the house a modern and inviting face and thus become part of the whole furniture concept that extends into the garden area. Of course, iron door canopies serve a practical purpose as well: They are supposed to protect the visitor and shelter him from rain, snow, and wind. 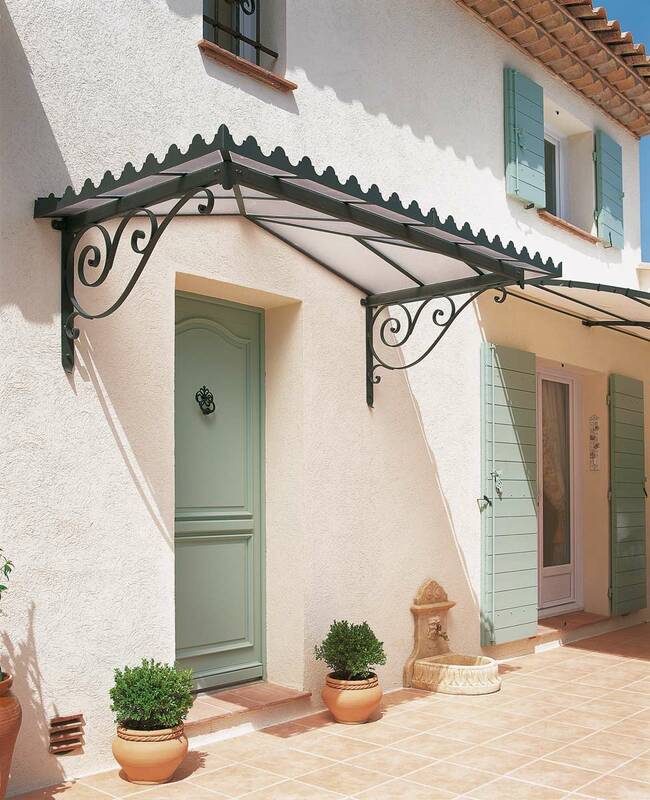 A modern door canopy by Unopiù with its design “made in Italy” and its well-tried excellent production quality combines high-class materials and skilful craftsmanship, so that neither residents nor guests are left standing in the rain. You can put down your groceries, close your umbrella or look for your keys while the door canopy already provides shelter. Your guests will discern your sophisticated taste and your sense of style not upon entering your house or your garden but already on your doorstep. The structure of the modern door canopy is made from galvanized iron with powder coated finish, making it long-lasting and weatherproof while at the same time looking timelessly modern and fitting in harmonically with every front door and façade. Unopiù’s door canopies are as individual as all our products. They can be widened with extension modules and can be adapted to every front entrance. The canopy itself is made from plastics, specifically goffered polycarbonate which is easy to clean. Goffering (from the French “gaufre” for waffle) is a procedure during which the surface of the canopy gets a pattern.